The Woods Hole Marine Biological Laboratory on Cape Cod, MA is one of the world’s preeminent research facilities. Even before his expulsion by the Nazis in 1934, Rudolf Höber traveled several times from the University of Kiel in Germany to Woods Hole to conduct experimental research in cellular physiology there. After joining the faculty of the University of Pennsylvania Medical School in 1934, he received regular grants to work at the Woods Hole labs in the summers. Josephine Höber, a medical doctor by training, collaborated in the laboratory work and in writing up the results. Rudolf and Josephine’s joint articles were published in the major scientific journals in the field. 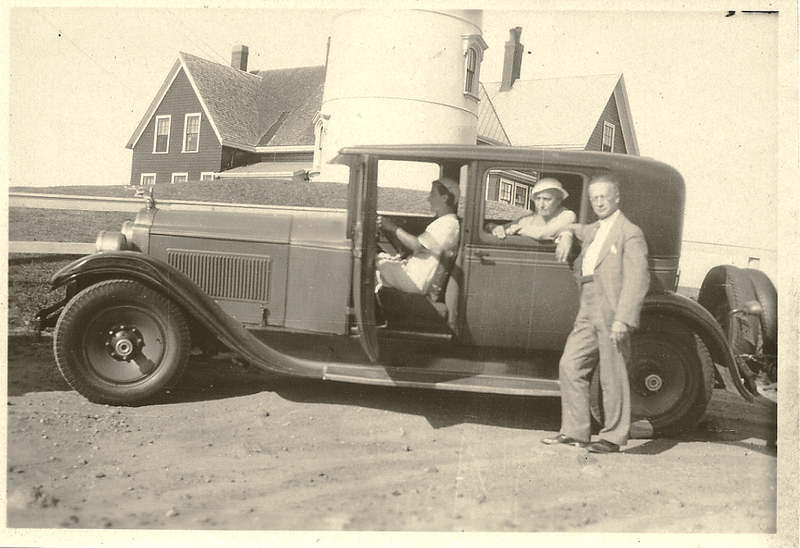 In this 1937 photograph, Rudolf stands next to Blue Boy, the Höbers’ eight-cylinder Model B Ford sedan. Josephine is in the back seat and their daughter Ursula, then 25 and a recent graduate of the Penn Medical School, is in the driver’s seat. The picture was taken at the Nobska Point Lighthouse, a few miles from Woods Hole. Why do I write about my family and why, in particular, do I write about Hoebers in Germany and their passage to America? From the dark harbor soared the first rocket of the firework display organized by the municipality, and the town acclaimed it with a long-drawn sigh of delight. Cottard, Tarrou, the men and the woman Rieux had loved and lost — all alike, dead or guilty — were forgotten. Yes, the old fellow had been right; these people were “just the same as ever.” But this was at once their strength and their innocence, and it was on this level, beyond all grief, that Rieux could feel himself at one with them. And it was in the midst of shouts rolling against the terrace wall in massive waves that waxed in volume and duration, while cataracts of colored fire fell thicker through the darkness, that Dr. Rieux resolved to compile this chronicle, so that he should not be one of those who hold their peace but should bear witness in favor of those plague-stricken people, so that some memorial of the injustice and outrage done them might endure; and to state quite simply what we learn in time of pestilence: that there are more things to admire in people than to despise. Nonetheless, he knew that the tale he had to tell could not be one of a final victory. It could be only the record of what had had to be done, and what assuredly would have to be done again in the never ending fight against terror and it relentless onslaughts, despite their personal afflictions, by all who, while unable to be saints but refusing to bow down to pestilences, strive their utmost to be healers. And indeed, as he listened to the cries of joy rising from the town, Rieux remembered that such joy is always imperiled. He knew what those jubilant crowds did not know but could have learned from books: that the plague bacillus never dies or disappears for good; that it can lie dormant for years and years in furniture and linen-closets; that it bides its time in bedrooms, cellars, trunks and bookshelves; and that perhaps the day would come when, for the bane and the enlightening of men, it would rouse up its rats again and send them forth to die in a happy city. 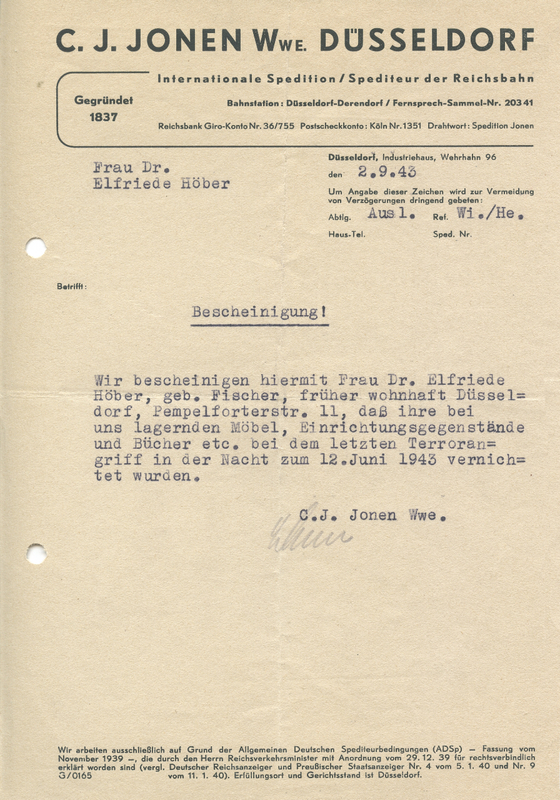 This slip of paper was found in an old file belonging to Johannes and Elfriede Hoeber. Before they left Germany in 1939, they placed everything they owned in storage, including nearly a thousand books, antiques and irreplaceable historical documents. This paper was prepared on September 9, 1943 but probably did not reach Johannes and Elfriede until after World War II ended in 1945. We hereby notify Dr. Elfriede Hober, nee Fischer, formerly residing at Pempelforterstrasse 11, Duesseldorf, that the furniture, furnishings, books, etc. 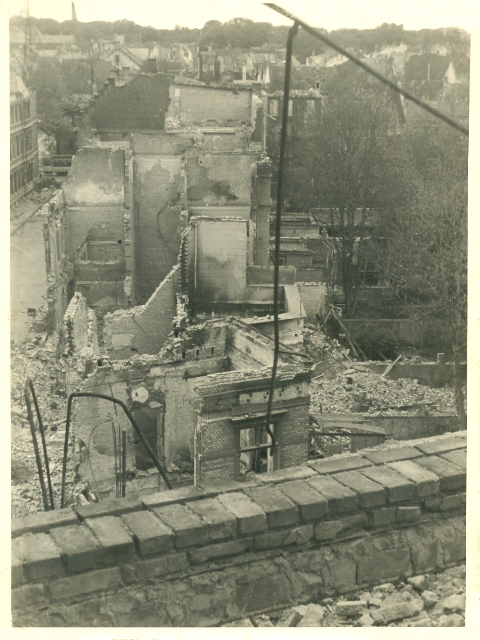 stored with us were destroyed in the last terrorist attack on the night of 12 June 1943.